This document presents guidelines for building third-party products used by Open CASCADE Technology (OCCT) and samples on Windows platform. It is assumed that you are already familiar with MS Visual Studio / Visual C++. You need to use the same version of MS Visual Studio for building all third-party products and OCCT itself, in order to receive a consistent set of run-time binaries. It is recommended to create a separate new folder on your workstation, where you will unpack the downloaded archives of the third-party products, and where you will build these products (for example, c:\occ3rdparty). Further in this document, this folder is referred to as 3rdparty. This is to avoid extra prefix 't' in the library name, which is not recognized by default by OCCT build tools. Edit file makefile.vc replacing strings "crt = -MD" by "crt = -MT"
Edit source file tclMain.c (located in folder generic) commenting out forward declaration of function isatty(). You might need to run this script twice to have tclsh executable installed; check subfolder bin of specified installation path to verify this. Apply the same steps as described for building Tcl above, with the same INSTALLDIR. Note that Tk produces its own executable, called wish. You might need to edit default value of TCLDIR variable defined in buildall.vc.bat (should be not necessary if you unpack both Tcl and Tk sources in the same folder). Unpack the downloaded archive of FreeType product into the 3rdparty folder. As a result, you will get a folder named, for example, 3rdparty\freetype-2.4.10. Further in this document, this folder is referred to as freetype. 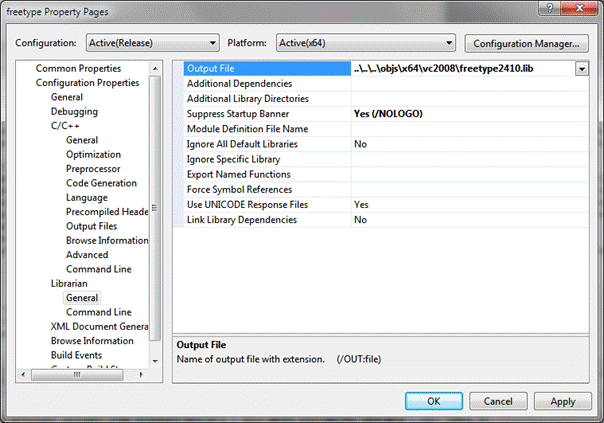 Open the solution file freetype\builds\win32\vc20xx\freetype.sln in Visual Studio. Here vc20xx stands for your version of Visual Studio. Select the configuration to build: either Debug or Release. As a result, you will get a freetype import library (.lib) in the freetype\obj\win32\vc20xx folder. As a result, you will obtain a 64 bit import library (.lib) file in the freetype\x64\vc20xx folder. To build FreeType as a dynamic library (.dll) follow steps 6, 7 and 8 of this procedure. Open menu Project-> Properties-> Configuration Properties-> General and change option Configuration Type to Dynamic Library (.dll). As a result, you will obtain the files of the import library (.lib) and the dynamic library (.dll) in folders freetype \objs\release or \objs\debug . If you build for a 64 bit platform, follow step 5 of the procedure. building mode is opt (for Release) or deb (for Debug). The include subfolder should be copied as is, while libraries should be renamed to freetype.lib and freetype.dll (suffixes removed) and placed to subdirectories lib *and *bin, respectively. If the Debug configuration is built, the Debug libraries should be put into subdirectories libd and bind. This third-party product is installed with binaries from the archive that can be downloaded from http://threadingbuildingblocks.org/. Go to the Download page, find the release version you need (e.g. tbb30_018oss) and pick the archive for Windows platform. Unpack the downloaded archive of TBB product into the 3rdparty folder. Further in this document, this folder is referred to as tbb. Unpack the downloaded archive of FreeImage product into 3rdparty folder. As a result, you should have a folder named 3rdparty\FreeImage. Further in this document, this folder is referred to as freeimage. Open the solution file freeimage\FreeImage..sln* in your Visual Studio. If you use a Visual Studio version higher than VC++ 2008, apply conversion of the workspace. Such conversion should be suggested automatically by Visual Studio. Select a configuration to build. Choose Release if you are building Release binaries. Choose Debug if you are building Debug binaries. Select a platform to build. 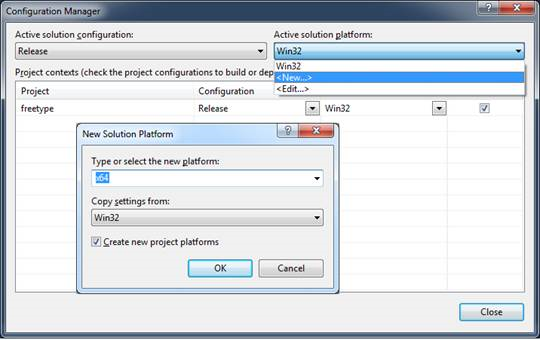 Choose Win32 if you are building for a 32 bit platform. Choose x64 if you are building for a 64 bit platform. As a result, you should have the library files of FreeImage product in freeimage\Dist folder (FreeImage.dll and FreeImage.lib) and in freeimage\Wrapper\FreeImagePlus\dist folder (FreeImagePlus.dll and FreeImagePlus.lib). VTK is an open-source, freely available software system for 3D computer graphics, image processing and visualization. VTK Integration Services component provides adaptation functionality for visualization of OCCT topological shapes by means of VTK library. Download the necessary archive from http://www.vtk.org/VTK/resources/software.html and unpack it into 3rdparty folder. As a result, you will get a folder named, for example, 3rdparty\VTK-6.1.0. Further in this document, this folder is referred to as VTK. Start CMake-GUI and select VTK folder as source path, and the folder of your choice for VS project and intermediate build data. Select the VS version to be used from the ones you have installed (we recommend using VS 2010) and the architecture (32 or 64-bit). Generate VS projects with default CMake options. The open solution VTK.sln will be generated in the build folder. Build project VTK in Release mode.